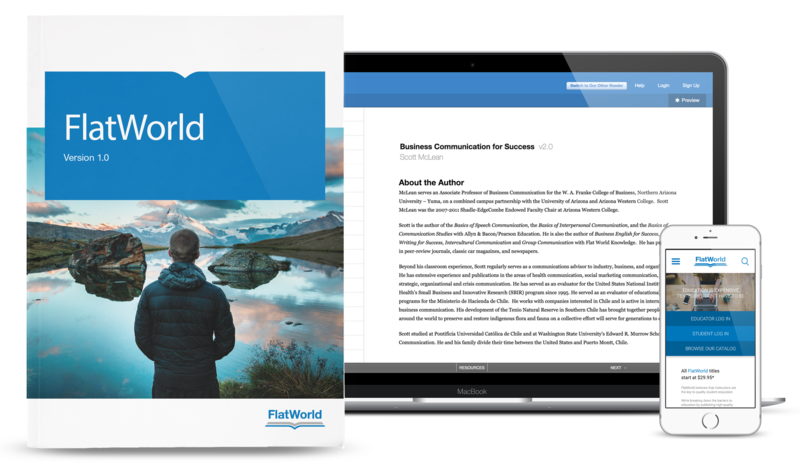 FlatWorld publishes high quality textbooks at prices students can actually afford. We don’t overcharge or overcomplicate. Educators shouldn’t have to choose between high quality and fair pricing. We are rewriting the rules of textbook economics to make textbooks affordable again. FlatWorld believes that the instructor is the key to a quality student education. It is our mission to empower you – and your students. We are working to put high-quality, affordable textbooks back within the reach of every student. Textbooks didn’t used to be this expensive and they don’t need to be this expensive. We know that at dramatically lower prices, more students can afford a new book: trading price for volume keeps our accountants happy and it makes our instructors and students happy too. We have worked hard to streamline our processes, starting with our digital-first publishing platform. We pass on the savings from driving out inefficiency, waste and overhead by lowering prices even further. Lastly, we’re publishing textbooks, not conducting brain surgery. So we’re just fine with our combination of fair margins and high growth. Our modern publishing platform allows our professors to get up-to-date content into the market rapidly. Each textbook is then easily customizable and comes equipped with a full-range of instructor supplements and a homework system at no additional charge. We’ve designed our website, books and interfaces to be easy-to-use — no training or tutorials needed. We focus on the additions that drive value, because we believe that efficient and affordable makes your life easier and your students more successful. Education is expensive. Textbooks don’t have to be. Acquired by Alastair Adam and John Eielson. FlatWorld moved its headquarters to Boston, MA. Evolved from Open Education Resources to Fair Pricing. Founded by former Pearson employees, Eric Frank and Jeff Shelstad. We cut the clutter and focused on what matters: high-quality textbooks, flexible formats, affordable pricing, and ease of use. We keep costs to a minimum by printing on demand with our digital-first model. So here’s to one less concession you (and your students) have to make.